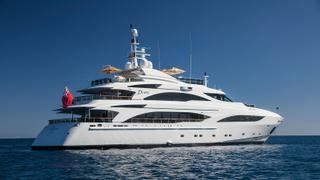 The 43 metre motor yacht Diane has been listed for sale by Simon Goldsworthy at Edmiston & Company. Designed by Stefano Natucci, Diane was built in aluminium to ABS class by Italian yard Benetti and delivered in 2007 with the same owner since new and most recently refitted in 2019. MCA compliant, her voluminous interior, designed by Francois Zuretti, accommodates up to 11 guests in five cabins laid out as a main deck master suite, two doubles and two twins, one with a Pullman berth. All guest cabins have entertainment centres, television screens and en suite bathroom facilities while a further five cabins sleep nine crew aboard this yacht for sale. The main saloon and sky lounge have a warm, inviting ambience for adults and children alike. The sky lounge, which is flooded with natural light, has a bar and extensive seating, leading out to the bridge deck with its large dining table, gym equipment and sun pads. The more formal main saloon and dining area is furnished with deep, luxurious sofas, large windows, a bar and dining table for ten guests. Up on the sun deck, guests are spoiled for choice between lounging on the sun pads, relaxing in the Jacuzzi spa tub or enjoying an al fresco drink and snack at the shaded bar and dining area. Her top speed is 20.5 knots and she boasts a maximum cruising range of 3,500 nautical miles at 12 knots with power coming from two 3,650hp MTU 16V4000M90 diesel engines. For added safety and comfort, she is fitted with Naiad zero speed stabilisers. Lying in Palma, Spain, Diane is asking €9,900,000.